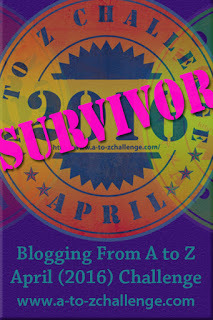 A-Z Blogging Challenge – Theme day! Since I managed with castles last year, I thought I would take my other great architectural love and expand on it. The UK has so many abbeys, cathedrals, priories and churches; many are in ruins, while some are vibrant parts of our communities. Rather like castles they sprung up following the Norman Conquest of England, suffered during wars and political upheavals, and remain part of the landscape of both cities and countryside. See you on April 1st for the letter A. This is my challenge, and choice. You can write about anything, there doesn’t have to be a theme. The challenge is to post everyday for a month using the letters of the alphabet as a guide. Looking forward to your posts and pictures! I am half way through my plan to visit every cathedral in England. I’ll soon be off again with my little tent to tick off a few more. I’m looking forward to seeing what you do with W. Winchester is my absolute favourite – I belong to the friends and make the 100-mile journey there often. Wells is nice too! A-Z Challenge – My theme for 2017! I’ve visited many cathedrals – but not Winchester. Wells is one of my favourites. I want to see this. Best of luck to you. This promises to be an inspiring A-to-Z theme. I look forward to your posts. I hope I can find inspiration to make this work. Is it possible you’ve rumbled my R 🙂 It’s very peaceful there in the valley. We visited on a blue sky day too. Glad you’ve decided to return for another round of April A to Z. Abbeys and cathedrals is a wonderful theme. So much interesting history and beautiful architecture. Best wishes for a successful challenge. Thank you. I’m hoping I’ll have the same inspiration as I did with the castles. This will be a beautiful theme I’m sure! Looking forward to it! The history and beauty go hand in hand. I hope I can do the subject justice. Really can’t wait to read this! I love churches and cathedrals, so I’m really looking forward to this. Best of luck with the challenge! That will be a fun theme. I bet there will be lots of history to learn from your posts. This will be a wonderful theme. Growing up in England, I saw many of these buildings on holidays as a child – amazing feats of engineering for the tools they had back then. Look forward to following! I hope I bring back some memories. Abbeys and cathedrals from A to Z??? How fascinating! Can’t wait to see your posts for the ever-challenging letters of Q, X and Z! Should be fun! I love the picture of Rievaulx Abbey. My husband and I visited when we were on holiday in North Yorkshire eight years ago. It was so peaceful there. Sounds like a fabulous theme – last year’ was so interesting. Apologies for taking so long to respond to your comment on my theme reveal – it’s been mad after getting back from our trip.